Grande Vegas Casino is giving every customer who plays its new feature-filled, safari-themed White Rhino online slot machine a free chance to win a Royal Safari. 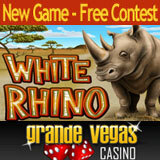 Until June 30th, all Grande Vegas players who play the new White Rhino game are automatically entered to win an exclusive safari trip, all expenses paid. One lucky winner will receive a unique wildlife adventure for two. White Rhino is a 5 reel, 25 pay-line online slot machine. Its beautifully illustrated safari theme has White Rhino substitutes that appear grouped on the middle reels and trigger the powerful White Rhino Feature with up to 30 free games to be won. The Kilimanjaro Re-spin Feature holds any improved combinations as the reels spin and the Guide Feature awards 10 free games with the chance to triple prizes. White Rhino includes a huge top 5-of-a-kind prize of 30,000 times the line bet, plus multiple random jackpots giving everybody a chance to win big on their safari adventure. Inspired by the young royal couple’s engagement on safari in Africa, this unique holiday to be won is an adventure fit for a King – and Queen. Like William and Kate, the contest winner will enjoy the thrill of up-close and personal eye-to-eye encounters with majestic rhinos and noble cheetahs. The full VIP treatment even includes a Swedish massage along with wine and chocolate in the privacy of a luxury safari tent. GrandeVegasCasino.com has more than $5 million in progressive jackpots which include some of the biggest currently available at online casinos. Jackpot Pinatas is currently over $1.7 million. Other million dollar jackpots are the Aztec’s Millions ($1.2 million) and the Midlife Crisis/Shopping Spree ($1,061,000). Cleopatra’s Gold is worth over a quarter million. Grande Vegas Casino, a state-of-the-art online casino owned by Tigress Management Ltd., offers hundreds of popular online casino games and welcomes players from around the world.